Discover the exact life cycle of the intriguing insect using this desktop kit. Directions as well as things to do are discussed in an useful book along with purchase information for praying mantis egg cases. As soon as the eggs arrive, you can view them as they hatch directly into nymphs, and develop directly into mature mantises, who may even create mantis babies to grow on your own. A net habitat securely houses the praying mantises as soon as they are adult; there you need to use the pipette to supply them with drinking water. A magnifier is additionally provided for watching in more detail as well as some padded tweezers permit you to properly lift the mantises out of their home. Live insects aren't going to be included; order details are supplied for mantis egg cases.Sometimes spelled preying mantid or preying mantis.These guys are cool critters that know how to keep any kid interestedin bugs. GreenEarth Fascinations Praying Mantis Kit GE101 ( Preying Mantis) . Curious young entimologists will learn about the Praying Mantis and its life cycle. 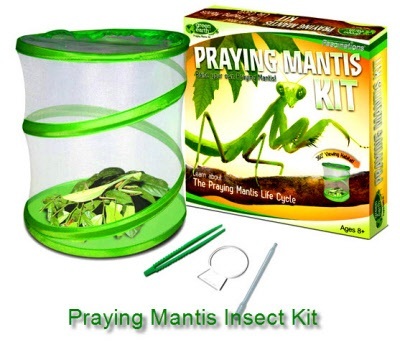 This World Alive praying mantis kit comes complete with fun activities in the book provided. Just set up the habitat in under a minute and you are set. Order your eggs from us for quick shipping . Once they arrive, the egg case is attached to a stick and left in the habitat. Over the next few days the nymphs will hatch. Until they grow large enough to hunt for insects they should be feed other live feed (flies, aphids, etc.). This takes place over a period of one to three months and continues with following generations of manti. Be Sure to send in your preying mantis pictures.